Whether it be a new build or retrofit into an existing home, double or single story we do it! Ducted air conditioning is the ultimate cooling solution for the modern Brisbane or Gold Coast home providing a discreet and unobtrusive cooling and heating solution. The system consists of an outdoor unit, an indoor unit installed in your attic space, ductwork that takes the cooled or heated air out to the vents or registers in your ceiling, wall or floor. There is also a return air outlet that draws air from your home into the indoor unit to be cooled or heated. The indoor unit fan motors circulate a regulated supply of cooled or heated air through ductwork and out to the registers allowing the cooled or heated air to be evenly distributed throughout the whole dwelling. To ensure the most efficient system we will always break your home into zones allowing you to only cool or heat the areas required. Ducted air conditioning can offer you even more, with Advantage Air’s, air distribution system you can separately control up to 10 zones in your house at different air flow rates or have the zones temperature controlled via independent temperature sensors. This system is controlled from an 8” wall mounted tablet, located at the most convenient location in your home. The tablet has Wi-Fi capability allowing you to connect your smart phone to the system which then doubles as your personal remote control, allowing you to adjust and control the temperature from anywhere in the world. You have decided to install a ducted air conditioning system in your home, this is one of the biggest investments you will put into your house and you need to get it right! The first thing is to calculate the size system you need to efficiently cool and heat your home, a small system won’t be able to keep up on the hot summer days and too large a system will draw unnecessary power. The biggest factor in determining your system size is the size of your home, then we look at the homes build, how well it is insulated, any large open areas or windows and any extra heat producing sources. Finally we look at the use of your home areas and how this could affect the system size required. Floor plans of the home are used to help determine system size as well as size and quantity of outlets. With the size system determined we need to inspect your roof space to ensure adequate area for the indoor unit as well as all ducting, manifolds and zone control dampers. We also need to ensure your switchboard can supply the required power safely. We then discuss with you and suggest the best break up of outlets and zones. Is your master suite large, if so we often suggest a smaller outlet in the ensuite or large WIR to ensure efficient cooling of the whole area. We look at large open plan living areas and calculate the size and number of outlets required and then find the best position for these registers. The return air grill location is also critical for the correct operation of your system as well as being in a location that is aesthetically pleasing; beside all this we need to work with the truss make-up of the house. With the outlet locations and sizes determined we make up a system design for the ducting to be installed in the roof space. We use advantage air ducting and exact air regulators to re-direct the air to the outlets as required. The Exact Air Regulators utilise opposed blade dampers which provide steady airflow and are operated by efficient 24v DC motors. The dampers open from close to fully open in 5% increments providing precise airflow control to each zone. The most basic and economical option is a standard system controller with a separate zone control switch which simply turns zones on and off as required. We find most of our clients go for the more technically advanced MyAir5 system. The MyAir5 system utilises an 8 inch tablet that controls both the air conditioner system and the zoning. The wall mounted tablet is a standard Android tablet which can also be used to download your favourite apps. This system allows for temperature controlled zones where the particular system has a temperature sensor and the air flow is regulated to maintain the set temperature. The MyAir5 also has Wi-Fi capability allowing you to connect the system to your smart device via the MyPlace app. This allows you to turn on and off or adjust your system from anywhere in the world providing you have an internet connection. Complete ducted air conditioner systems in double story homes provide additional challenges, something ClimateLink thrives on. The challenge with double story homes is running the ducts from the attic down to the ceiling level of the ground floor. For new builds this is not a problem as we work in with the builder to create voids within the home structure that can accommodate these dropper ducts. When retrofitting in an existing double story home we need to inspect the build of the home, we look at the floor plan and what room is above the desired outlet location in the lower level. Than we need to find a suitable place to run the dropper whether this be an inconspicuous corner of a bedroom or within a built in robe. The floor structure then needs to be inspected to ensure we can run our ducts between or through joists if required. 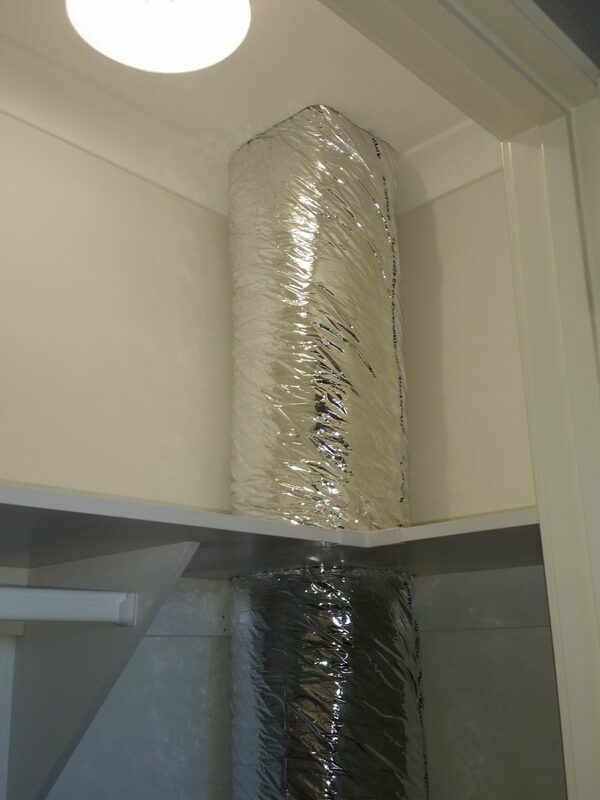 In some cases it is not possible to economically install a complete ducted system in a double story home. In this instance we will calculate the correct size system for the upper level, taking into consideration the extra heat load caused by the level below and supplement the cooling of the lower level with a split system or multi-head solution.